Hi, Tutorial time here, and even though I did this once a long time ago now for a magazine; I realised it never actually made it to my blog. Now with Mesh being a huge addition to the grid, one thing that is going to come into play a lot more often are alpha layers. I have already noticed that some are not exactly fitted to the exact shape of the mesh, which is not really surprising. So I have taken the time to show you how you can make your own, and then possibly open up the possibilities of more clothing for yourself… because you will know that if a demo doesn’t fit exactly, but you can make your own alpha, you can whip one up first, try the demo again and VOILA a 10L upload could make you incredibly happy. 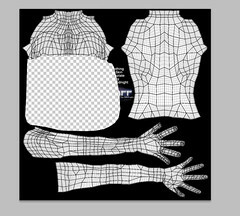 First thing to do is to get the avatar templates that are used for the real avatar body. They are located HERE , the better option are the Chip Midnight ones as they have clearer detail. 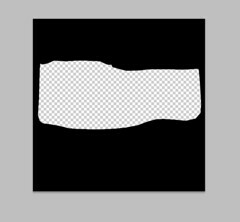 The first thing you do is open up the upper and lower body templates in your PS or Gimp program. Then save the upper and lower as as jpeg,png or targa, it doesn’t matter which, and it will not change the template. Once you have done that bring both into SL. Once you have them uploaded make a new folder in your clothing or body parts folder. Name it Template Layers. Then right click inside of it and choose New Clothes > New Shirt , then New Clothes > New Pants and then wear them so you look like you are wearing a white catsuit. Go into edit on the pants layer, and drag the template texture you uploaded to the texture panel on the pants, and save. Then do the same to the shirt layer. Once you have saved both you will see that every designer you have ever bought an item from deserves a round of applause, because this thing is seriously insane to work on. Now if you put back on the alpha layer that you got with your demo you can see exactly where on the template it goes. Then once that rezzes, you can wear the mesh and see where the alpha needs to be for you. Now go back to your PS or Gimp and get the upper clothing layer template. You can turn off every layer that you don’t need, and leave the one that makes the most sense to you. Then the rest of this is going to make more sense to you by how you feel the most comfortable with your tools. Some can use eraser, some just outline and delete, some will be all fancy, but the overall idea is, what you want to be alpha on your body, needs to be alpha on the template. Make sure you also check the back of your body, to see if the mesh is higher or lower than you need. I used theÂ lassoÂ tool to draw a little bit inside of the line I need, and then cut out the entire portion of the shirt I want alpha, then once I have done front and back I filled the rest with black. Saved as a png and uploaded into SL . 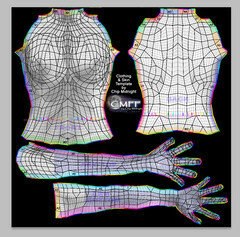 Then in the same folder I made a new alpha mask layer, named it tube top, then wear it, and you will see that you are popping right out of your mesh. 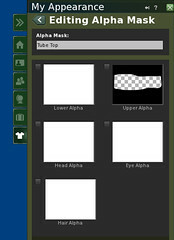 Go into edit on the alpha layer and add your new alpha texture. Now I am not a professional at this, I will admit it took me three times to get it spot on, the front was too high at first, then the back had to be lowered also. But if this was a gown or something with some serious money behind it, or I just really loved it so much as a top…well 30L to get it to fit is much better than walking away, or worse, spending however many L’s on it and not being able to wear it without changing my shape. Now the other big advantage to learning this is your older shoes, as well as layer limits that those that refuse to use V2 encounter. If a shoe/boot has an invisi prim attached to the shoe/boot then this wont work, but some shoes/boots had them as separate attachments, so this will. Do not wait around for stores to update, they haven’t up until now, so pretty much given that they are not going to. If you have a pair of boots you love and want to wear with alpha instead of invisiprims then follow the same steps on the legs potion of the templates. Boots are actually much easier as they tend to be really easy to work out where they end. Shoes are harder, as the heel style and other things come into play, but again, if you don’t want to see it, you make it alpha. So it is worth a try. Another thing is that if you have layer limits, now with mesh, or just because other things you wear use alpha, you can make your own alpha mixes. Some stores are kind enough to include the alpha texture with the purchase, so you can do this, but consider combining boots with corset, or boots with tube top, and voila, only using one layer instead of two. I hope this helped, and I hope that it saves you some concerns you may have about only being able to change shape with Mesh. In the pics I am using the Full Perms Tube top by Random Crap by Damien Fate/Washu Zebrastrip, you can find so many full perms Mesh items there or on their marketplace page. Demo hoodie available. The secret passage is in the corner of the station between the wall and the train, just walk through the wall and you will find the mesh items, or IM Washu Zebrastripe for help. OMG! Thank you for this posting. I have been trying to resolve this issue for two days and this tutorial was perfect and so easy to understand. You saved me hours of misery. Thank you! I managed to throw some “bike shorts” on to resolve some mesh skirt issues while… dancing under the sea. Because Second Life ‘o course. Something everyone that hates when an alpha doesn’t fit right.